SAVE ENERGY - The MAGICOOKA is a result of many years of research and development. It's no longer necessary to spend hours watching the meal cooking in the conventional manner. Meals remain warm up to 12 hours. They can be prepared in the morning and served in the evening. 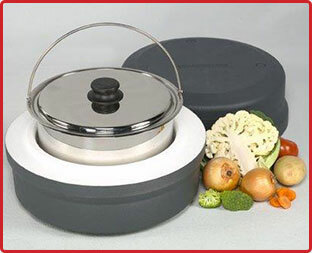 Place ingredients in the stainless steel thermo unit and cover with lid. Remove from the stove and immediately into the energy retainer, ensuring that the lid has been replaced. Your time spent cooking is now done! Do not at any stage lift the lid of the energy retainer until the recommended cooking time has elapsed. IMPORTANT: The ENERGY RETAINER IS A FRAGILE UNIT - please handle with care and do not expose to heat.